Stylish Clubmaster shape with adjustable nose supports for extra comfort. Unisex size (55) suitable for men and women. Available in a large range of colours. Engineered from a high-tech extremely durable TR90 memory polymer. Flexible and incredibly lightweight so great for sports - skiing, snowboarding, running, cycling, golf, beach volleyball etc. High Quality Polycarbonate Polarised Lenses with 100% UVA and UVB protection for optimal vision clarity. Sunglasses break. All. The. Time. Whether it be sitting on them & the hinge breaking off or trapping them in a car door, most of us at some point will have broken our favourite pair of sunglasses replacing them time and time again. What if you could buy a pair of sunglasses that changed all that? • Flexible Swiss TR90 Memory Polymer Frame & Arms For Insane Durability. • Polarised Polycarbonate Shatter Proof Lenses With 100% UVA/UVB UV400 Protection For Supreme Vision Clarity. • Interchangeable Pop Off Arms For Custom Colour Styling + Added Durability. • Lightweight Frames Give You a Comfortable Fit. • Hard Case & Soft Microfibre Cloth Included. • Lifetime Warranty on Frames & Arms. • CE Approved To European Optical Standards. 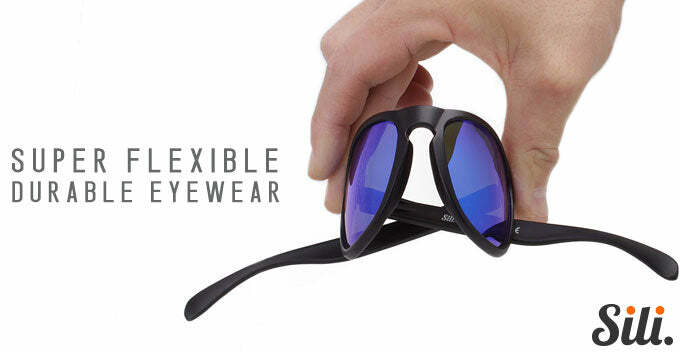 Sili has engineered a range of sunglasses, made from only the best materials, at a price you can afford. Our lenses are polarised as standard with vision clarity to rival the largest of brands. The frames flex & bend offering unrivalled durability while ensuring your favourite pair of sunglasses last even the harshest of batterings you give them. Interchangeable pop off arms mean you can switch up the colours, plus if you sit or step on them they might pop apart but can be easily put back together again. You'll not only be getting the best pair of sunglasses you'll ever own, you'll also receive fast registered shipping. Your Sili's will arrive in a stylish hard clam shell case along with cleaning cloth & soft bag for storage. You'll also get a registration card for your lifetime warranty & contact details for our UK customer support team.